Ten minutes to twelve. Edward kept on glancing at his watch nervously. Fifteen years had passed since that day, yet every moment was crystal clear. He checked the date again on his cell phone, 11 July 2005 and to think more than a decade had passed since that day. It was the summer of 1990, the question to be asked was whether Ronald would remember this day with equal importance. Edward kept on contemplating whether it was the right decision to come down at the oval garden, taking a day off from the court. He looked around the park, it still had that old earthly charm it used to. Children could still be seen running around the trees , under the log caves. New mothers could be seen walking their new born, closely followed by the maids. He could hear someone listening to Ronnie "Loveboy" very loudly. "Loveboy?" he started wondering. "Who keeps that for a name?" But he had to admit "Loveboy" had become quite a sensation since the last 4-5 years. Topping the charts continuously and regularly. Suddenly he had become an icon all the boys wanted to be, and the girls wanted to marry. Although he detested the name he had to admit he had brooding good looks accompanied by a gifted voice. No wonder his wife Annabelle had his wallpaper on her computer. Looking at the people around him, Edward's mind went back to his schooling days. Edward and Ronald were best buddies in school. 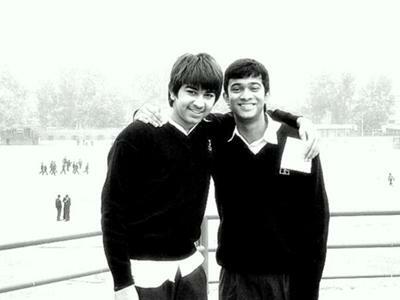 They were called the "Notorious Nicks" of the school as they would always land themselves in trouble. Spending more time in the Principal's office then the classroom. Their grades were equally bad. Ronald always had issues at home, due to which eventually his parents separated. As a result Ronald shifted base with his mom and went to stay at a different state with his Grandparents. On the day he was leaving both of them mutually decided as a sign of their true friendship they will meet on that exact date fifteen years later. The day was 11 July 1990. "But where should we meet?" Inquired Edward. "Oval garden 12 noon," said Ronald "since we spend most of our time there." With the date and time decided both the friends parted ways. With Ronald gone, Edward started to concentrate on his studies more, possibly because he never learned to make new friends after that. In the initial few months he got letters and postcards from Ronald telling him how boring it was without him. His marks increased considerably. The last he had heard of him was 10 years back when he got a Christmas postcard from him, nothing after that. Edward did his graduation from Harvard in Law and joined a firm. Within a span of few years he had risen up the levels of corporate ladder. Now he was the head Advocate at his firm with close to 150 employees working under him. Obviously he led a comfortable life as his job gave him a comfortable salary. Suddenly it dawned on him that it was stupid of him to come and wait for his friend at that particular spot. Who knew where he would be right now? Whether he still remembers his friend? Let alone remembering anything about this rendezvous. Secretly at the back of his mind he still felt Ronald would come. "Mr. Edward McKenzie?" A boy about twelve years old was looking at him enquiringly. "Yes? May I help you?" I hope this letter reaches you. After so many years its unreasonable to expect someone to remember. I do. So in case you read this I am sorry I could not come and meet as I have some issues back here. However if you could jot down your address at the back of this paper I will come and meet you next Sunday at 9 am sharp. Edward wrote down the address and handed it over to the boy and started walking back towards his car. On the way back home he couldn't help but wonder where he had seen that little boy who came to hand over the paper. Somehow he seemed very familiar. On the prescribed day, his doorbell rang at 9 am sharp. Sitting in his room inside he could hear a visitor asking for him. Edward rushed out to greet his friend with open arms. "Ronald, you have changed so much in so may years. I mean you still look like your in your early twenties." "You are a lawyer, aren't you?" "Saw your interview in Business Today on the Lawmakers section." "How are you? Where are you these days?" asked Edward. "I am doing ok, have been traveling a lot." "All that is fine but why didn't you come that day?" "When you could send a note I am sure you could have..."
Edward glanced outside, a huge crowd had gathered outside and was jumping and shouting recklessly. He could see posters saying "WE LOVE YOU" hanging from the houses just opposite. "What is all this noise about..the kids are going crazy. Seems like a riot." He looked around and his mouth opened like a hollow and almost dropped to the ground. Ronald was smiling at him, but now his hair seemed different and the mustache was gone. The wig and the fake mustache were hanging between his fingers. "RONNIE LOVEBOY?" Edward screamed at the top of his voice. Ronald put back the wig and mustache and said, "I hope you understand why I could not meet you in public. Fame comes with a price, I can hardly do what I feel like without getting noticed or mobbed. I thought my son would not be able to find you in the park. It is always so crowded, thankfully he did." His son? Now it struck Edward as to why that boy seemed so familiar. The boy was a striking resemblance to Ronald when he was that age. Even the haircut. No wonder it made his head spin thinking about where he had seen the boy before. "RONNIE MARRY ME!" shouted someone from outside. "I think I should leave now. But I know where you live now. So I will keep in touch and meet you whenever I can." Saying this Ronnie "Loveboy" put on his dark glasses and left. To think Ronald Arthur Jr. had changed to "RONNIE the "Loveboy" in fifteen years. Such is the irony of life. This story is very poignant and touching. Well done. well written.Full marks to you.